Yes. 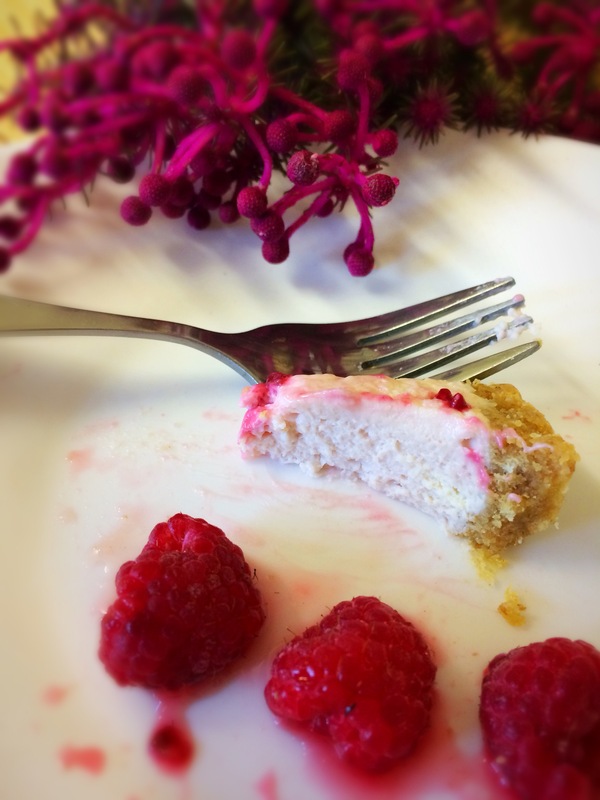 Cheese free Cheesecake. I’ll start by explaining myself. 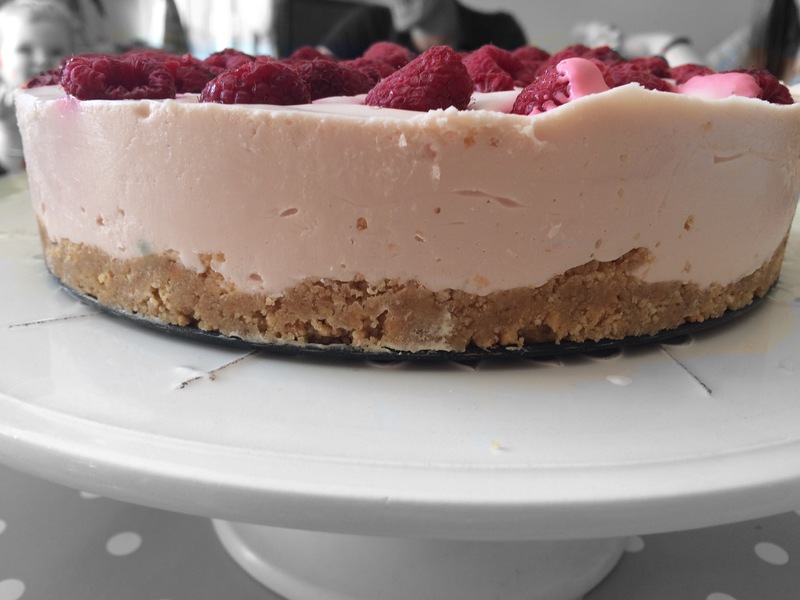 On Thursday I set out with the intention of making a Raspberry cheesecake in preparation for Sebastien’s 3rd birthday, only to realise I didn’t have any cream cheese in the house. I really couldn’t be bothered dragging the kids to the shops, so raided the cupboards for some inspiration. After digging out a tin of Condensed milk, I had a quick chat with friend and food blogger, Donna from Bobys’s mum, this is the (Delicious!) result. Thank you Donna for giving me the confidence this would work! 23cm loose bottom cake tin, greased and lined. Pop the digestive biscuits in the freezer bag and bash with a rolling pin until you have a fine crumb. 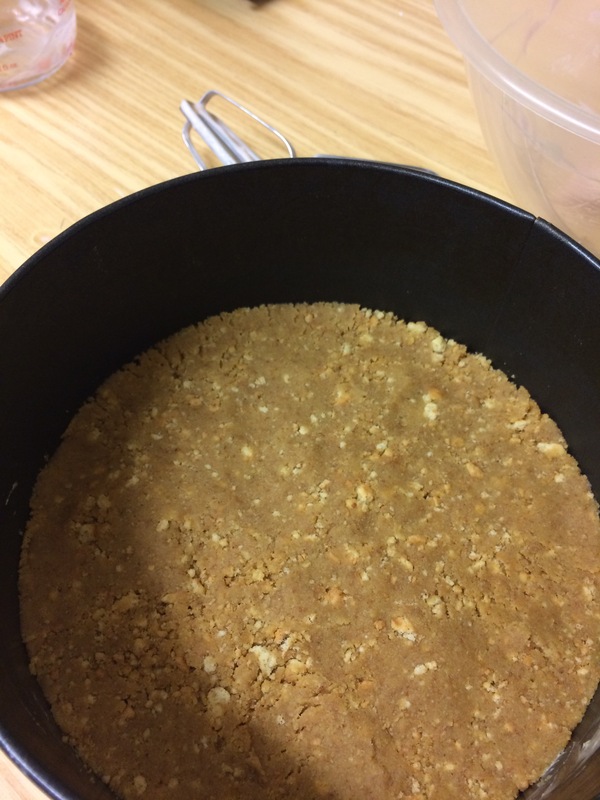 Mix the melted butter in to the biscuit crumb until well coated. Tip the mixture into your prepared tin and press firmly down into the base to create an even layer. Chill in the fridge for 1 hour to set. Cut the jelly in to small cubes, add the water and microwave for 45 seconds-1 minute. Stir until the jelly is completely dissolved. Pour the melted jelly in to the condensed milk and whisk on high for 3-4 minutes until well combined and glossy in texture. In a separate bowl, whisk the double cream on high until stiff. Once stiff, fold in the condensed milk, then spoon the mixture over your biscuit base. Smooth the top with a spatula or the back of a tablespoon. 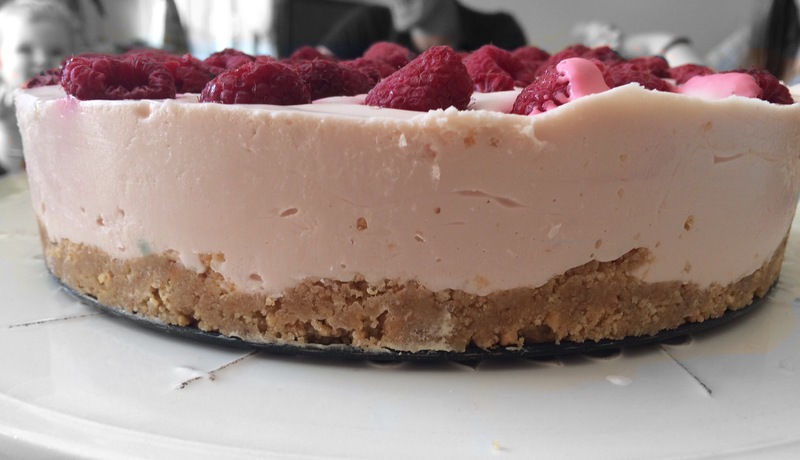 If you are using frozen raspberries, add them to the top of your cake before placing in the fridge. If using fresh raspberries, add them once the cake has been setting for at least 1 hour. Leave to set for a minimum of 6 hours, preferably overnight. Remove from fridge 15 minutes before serving. This makes it easier to slide out of the tin. Ooh yay! Let me know what you think! It’s a family favourite here. I probably make one every 10 days or so! Oh I love cheesecake too! We eat it a lot in this house! This one was definitely a crowd pleaser though! May have to make it again! Thank you! It taste as good as it looks! It definitely needed the Raspberry though or it would have been über sweet!